There aren’t many business tools that rank as the best year after year. Adobe Connect is one of those products! 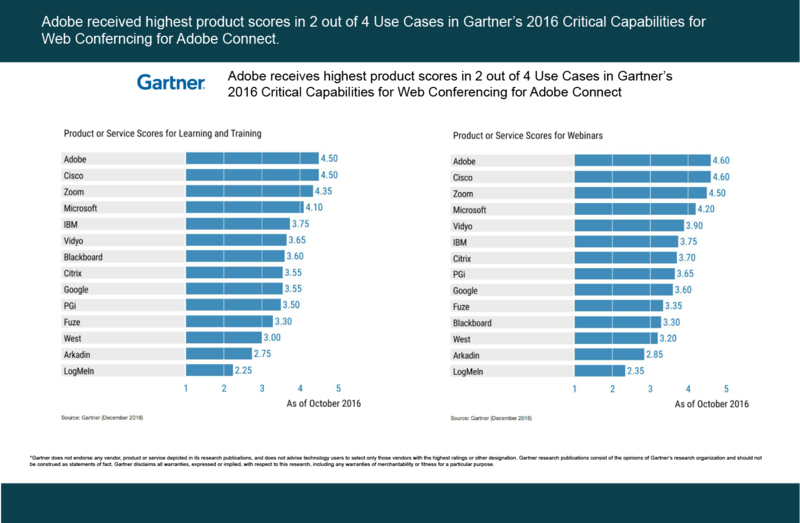 Check out Adobe Connect’s scores for Critical Capabilities! As an Adobe Connect Gold Partner, MeetingOne is pleased and honored that Adobe Connect has been so prominently recognized in this report. Gartner thoroughly evaluates vendors based on criteria ranging from “Market Understanding” to “Customer Experience.” We believe the positioning in this report is a testament to Adobe Connect’s commitment to providing a sophisticated, best-in-breed web conferencing platform that fulfills customers’ needs. Don’t get stuck with a web conferencing platform that is just “good enough.” You need a platform that goes beyond sharing – and encourages collaboration! Continue reading to learn why Adobe Connect is so highly lauded. Scoring for the categories was based upon how well each platform met the use case capacities for varying online meeting/event scenarios. To be a leader in Learning & Training, a platform must have the right features to create an instructional environment that drives engagement and helps learners retain information. Leading platforms provide instructors the best tools to for reaching hundreds of participants in an interactive manner. Leaders in the Webinar category offer powerful presenter controls and the scalability needed to host events with thousands. These platforms also need to offer “staging areas” and the option for technical support. “Adobe Connect has a rich set of APIs and an extensive collection of ‘pods’ or modules to enhance the platform, including the ability to draw in dynamic HTML5 content. Adobe Connect leads the way on many fronts. The desire to pursue excellence and customer satisfaction is what drives Adobe to improve its product continuously. Cloud/SaaS Delivery: Adobe Connect’s cloud delivery setup allows users to access software in a simple and convenient way. Internal Delivery: Easily being set up across entire companies provides Adobe Connect users an assurance of quality control. Host Controls: Advanced host controls make Adobe Connect a sensible choice for organizations looking to hold engaging virtual sessions. Client Experience: The immersive environment of Adobe Connect creates a memorable experience for users. APIs: Numerous APIs make Adobe Connect an ideal communications platform for businesses of any size. Instructional: Industry-leading engagement tools make Adobe Connect a desirable platform for delivering live online trainings. 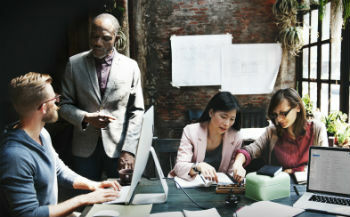 Scalability: Whether you have a small team or need a solution to reach thousands, Adobe Connect can be scaled to meet your business needs. Being identified as either “Excellent” or “Outstanding” in 7 categories is no small achievement. Of the 14 web conferencing platforms surveyed, only three other competitors are ranked as highly as Adobe Connect. 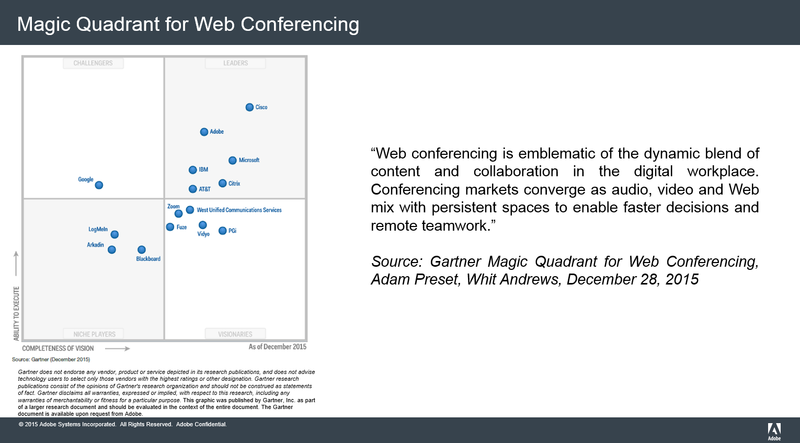 We encourage you to read Gartner’s Critical Capacities for Web Conferencing report to compare & contrast web conferencing vendors, available here. For all the favor Gartner has shown Adobe Connect, it’s still important to point out that Adobe Connect is only further enhanced by their partners! As Gartner puts it, “Adobe Connect uses a strong ecosystem of channel partners that augment the service for everything from audio conferencing to global content delivery networks.” Partner channels are essential for meeting enterprise needs and providing a personalized experience. Gold Partners like MeetingOne are here to help you make the most out of Adobe Connect. Whether you want to ensure the highest quality audio during your online events, or desire to bring interactive virtual classrooms to your LMS, look no further than MeetingOne! Talk with a Product Specialist to discuss your needs. Stay up on all the news surrounding Adobe Connect – subscribe to our blog!